"I wear size 9 shoes so you should too!" If I was to say that to you, you would think it was daft, yet we hear this sort of advice about mouthpieces all the time. I used to play on big mouthpieces (I played a Wick 2 in the front row in first section and championship section - what a mad fool I was), but after I changed my embouchure set up to get a smaller aperture I had to shift to smaller mouthpieces. I actually play on a 4B now. Its not ideal. I would prefer to play on a 4 or a 4 1/2 but my cornet has to have the shanks turned down slightly to get the gap right so changing mouthpieces is a chore, and I can't pass them on to anyone once they have been cut. This is entirely my fault as the instrument was gapped for a Bach mouthpiece when it was made - a huge error and not easily corrected on this particular cornet. Need for endurance (brass band cornet players play like violins in an orchestra so there is more need for endurance than with the trumpet meaning that rims are likely to be wider or flatter than trumpet). Need for flexibility (thinner rims give more flexibility but increase attack, this is why I think the Wick rims are the way they are - to prevent very brassy attacks without sacrificing flexibility too much). Resistance requirement (in general tighter feeling instruments work better with slightly more open mouthpieces and visa versa - this also has a lot to do with the mouthpiece gap). How much pressure you use when playing. Whether you are required to play after the point when your lips have gone (a serious issue for brass band and big band players who have no choice in the matter!). The sound model you are aiming for. Physiology of the lips (children have smaller mouths and need smaller mouthpieces, people with big lips can't play on really shallow mouthpieces without adopting odd embouchures). I think that resistance is the key. An instrument set up feels best is when the resistance of the whole system from the lips through to the bell is optimal for that particular player. This is where adjusting the gap can make a huge difference. 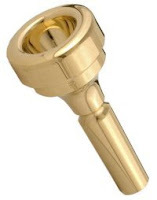 By gap I mean the distance between the end of the mouthpiece and the beginning of the leadpipe. This has a huge effect on resistance and the feel of the instrument. Incidentally, old cornets with removable shanks usually have no gap so this is a relatively new issue (past 30 years or so). That's my thoughts on the subject as someone who has been through more mouthpieces than hot dinners. How many instruments can I actually play?